Brooks Brothers is commemorating its bicentennial year this year, and what better way to celebrate than to serve up a monograph that recounts its history via compelling visuals and great text. The once bastion and epitome of conservative dressing has morphed into an internationally recognized and revered fashion brand for the entire family. Long before there was the preppy of Ralph Lauren, Brooks Brothers was the home of the oxford cloth button down collar shirt, the navy blazer with brass buttons, grey flannels, and the rep tie. Still it remains home to Wall Street bankers, lawyers, professionals, college kids, fashion and entertainment legends/ icons as well as wannabe wasps who still fill their sartorial choices at one of their stores. To say it is a men’s club of sorts would be an understatement. The Brooks Brothers brand remains a silent signal to many that the gentleman whose wardrobe comes from this establishment has arrived . . . so to speak. Aside from the history of the brand the reader is afforded the opportunity to be educated about the context of Brooks Brothers in terms of its position and ranking within the history of men’s fashion. Did you know that there were actually Brooks brothers or that they were the first to import the Lacoste shirt way before there was an actual Lacoste brand? In Brooks Brothers: Two Hundred Years of American Style are many details of their methodology of retailing and how they spearheaded so many trends that most of us take for granted. There is a singular phrase in the book that struck this reviewer and fashionphile oddly, and that was that Brooks Brothers was referred to as American Sprezzatura; it is a concept that should be pondered and ruminated upon. Brooks Brothers was and still is to a great degree all about formulaic dressing, fitting in, and honing a look that was hugely defined and originated by them as a brand and retailer. The interviewees span an incredible range of those who have first-hand experience with wearing, encountering, owning, and remembering the brand. The stories are rather personal and highly relatable to almost any reader. 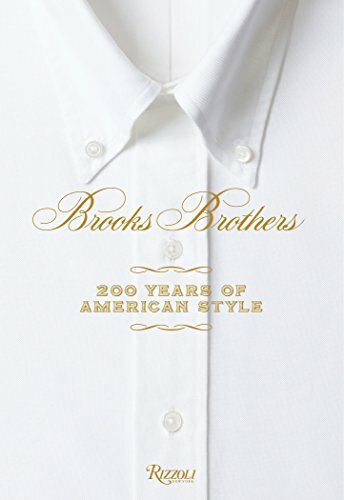 Dedicated readers of this genre will find that Brooks Brothers: Two Hundred Years of American Style will meet all their requirements and expectations. The book is visual, entertaining, informative, and contextual with no pretense whatsoever. Draw your own conclusions if these facets of fashion are on your book shopping and reading lists.